Around Tahoe ™ is Lake Tahoe's Audio Tour App! Hands-Free GPS Tracking self-guided audio tour. 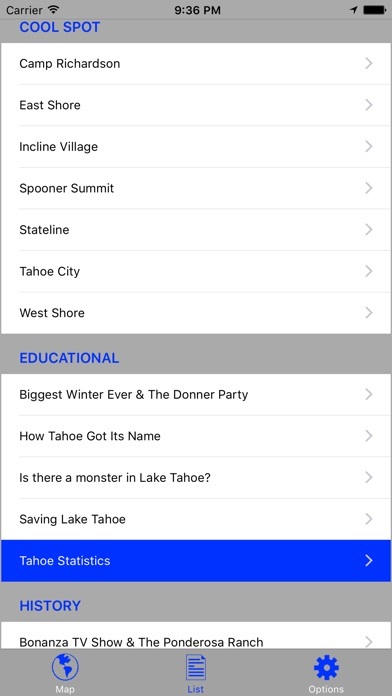 Go Around Lake Tahoe and the App will automatically play audio about Legends, Famous Movies, Unique History, Immense Wealth and Amazing Facts! • Tips: "Cools Spots" and sightseeing adventures, fun activities, dining and entertainment locations • Bonus: Lake Tahoe Inspired Music Tracks! • Share: Connect to bluetooth speakers for you or all to hear • Pictures of many locations • GPS: pinned map locations and integrated with your device map navigation. • Multiple pics per spot! • Easy to follow tour path with where to start and end. Stop and start anywhere you like. • Tour Zones - fast map panning and overview of the tour. 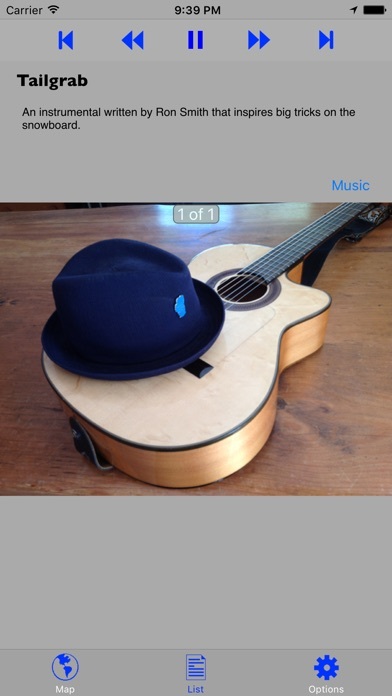 • Visual Audio Zones - you can see when the audio will be activated. No guessing where and when you can expect audio. • Directions - you can get real-time directions to any POI as expected from your smartphone. • Download it now on WiFi. No reservations, no sign-up process or fees. • Interactive to preview your tour. • No annoying ads. Audio Tracks Include • Cool Spots: Camp Richardson, East Shore, Incline Village, Spooner Summit, Tahoe City, West Shore • Educational: Biggest Winter Ever and the Donner Party, How Tahoe Got its Name, Is there a Monster in the the Lake? Saving Lake Tahoe, Tahoe Statistics • History: Bonanza TV Show and the Ponderosa Ranch, Frank Sinatra and The Cal Neva Resort Casino, John Steinbeck, Mark Twain, SS Tahoe Steamer, Snowshoe Thompson, Squaw Vally, The Angora Fire, The Godfather Part II and other Famous Movies filmed in Tahoe • Landmarks: Cave Rock, Emerald Bay, Fanny Bridge and The Truckee River, Tahoe Tavern, Thunderbird Lodge Music Tracks Include • Angora • Big Air • Dusk Upon The Lake • Loaded Lazy Leisure Life • Old Friend • Old School Rider • On The Banks of Frenchmens Creek • Perfect Tahoe Day • Ride Your Dreams • Ski Bum Entertainment Content author Darin Talbot Mobile software technology provided by iApp Tours. I loved that it knew where we were and gave us information as we got there. The narrator tells some interesting history of the Lake, some great sites to see, and local places to eat. T’s Mesquite Rotisserie was out of this world. Small whole in the wall we would have never tried had Darin not suggested in his app. He gave some interesting history about the island and the castle that isn’t posted at the lookout site. Thanks Darin. You did a great job. The music was great too. I was a little hesitant to purchase the app because it hadn’t been updated in a year and the last review was from 2 years ago. Bought it anyway and was happy that it worked great. 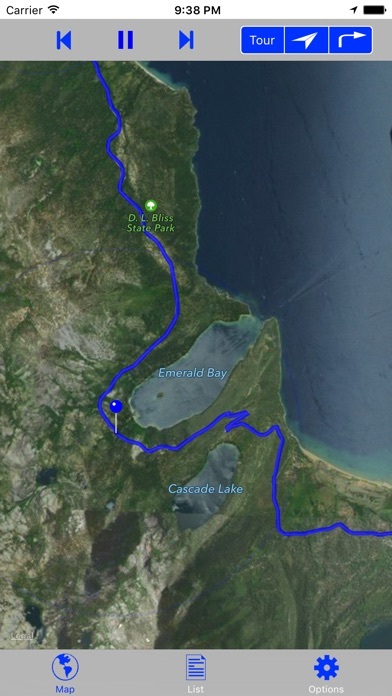 It was a great way to do a driving tour around Tahoe. My only complaint was that the blue route that is overlayed wasn’t always on a road. So I just stuck with staying on the roads the map shows. This didn’t affect the usability though. Still got a lot out of it. Excellent addition to a beautiful ride! This was such a great idea to do while driving around Lake Tahoe. It gave us a good amount of history and stories. I loved that it follows you around and tells you what you are seeing when you are at the spot. We took our time and did some of the suggestions offered in the tour. We also went back the next day to do a couple things we wanted to spend more time with. I highly recommend you adding this to your driving tour! I bought this app for my trip to Tahoe. It would not open. I thought maybe I had to be at Tahoe. Now I am at Tahoe and it still won't open and does not seem to be any way to get help. Can't send email to your support web site. I'm trying to send my modification recommendations, but your web site keeps erroring out. We just used this app today for the ride around the lake. It is very well done and added much to our experience. It is very rare for me to purchase any app for $, but this was well worth the cost. The synchronization with gps was great even when we passed through "no signal" areas. Thank you! Perfect app for Lake Tahoe!!! Great facts and folklore along the way around Lake Tahoe ! The integrated music by the local legend Darin Talbot really gives you the Tahoe feel while driving around the lake! 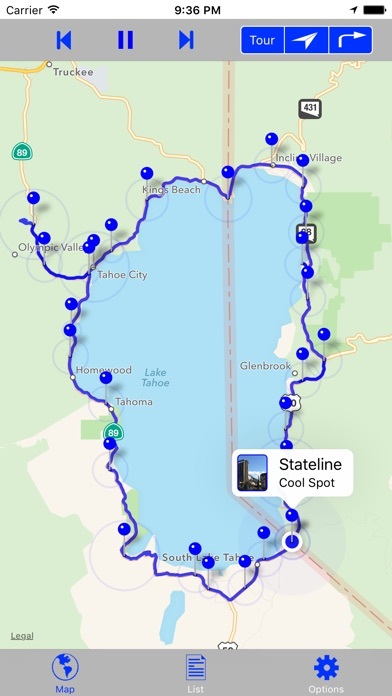 Perfect app for the those looking to receive full enjoyment while seeing world class Lake Tahoe, and at your own pace! 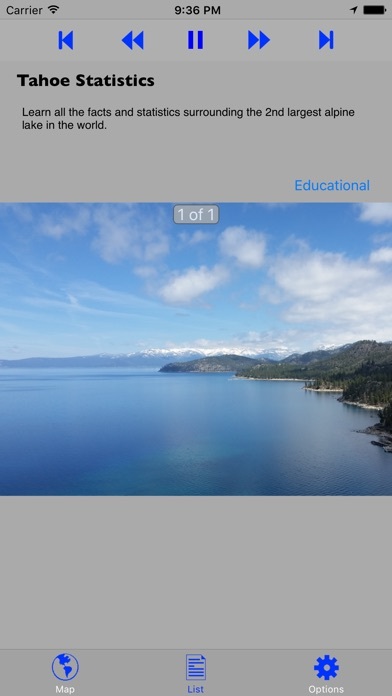 I bought this App because I wanted to just enjoy the majesty of Tahoe at my convenience, while being informed of all it had to offer. It completely filled all those needs and I Would highly recommend! I have driven around the lake a couple times before. But with the app, it told me about all the events that happen along the way. It made our drive more interesting. We live in Tahoe and often have visiting family and friends. We always listen to the app while taking them to our favorite spots around the lake. We still learn something new every time!